they shall run and not be weary; they shall walk and not faint. We can never fully understand the mind of God. His ways us just too high for us to comprehend. Through Bible study, meditation, and prayer we can know more about Him and more about how He operates. Actually the more we get to know Him we can even learn to think like God at times. However many of His ways are just over our heads and we are not able to fully grasp the way He works. We are not made to understand everything about how the Lord works. We are made to trust Him. The wrong attitude about how God works can create frustration out of fear. However the Christian can be at peace in any situation knowing that the Lord is in control of everything. The fact that God’s mind is higher than ours should not be irritating, but encouraging. We don’t have to worry about anything, even when we don’t know what is going on, because He is the Sovereign God! The verse quoted is incorrect. It reads "but they who wait on the Lord" which is an active statement, not a passive. It means "wait on" which is what a good waiter/waitress does, not what an inactive person does. An inactive person does not need his/her strength renewed. Yes. 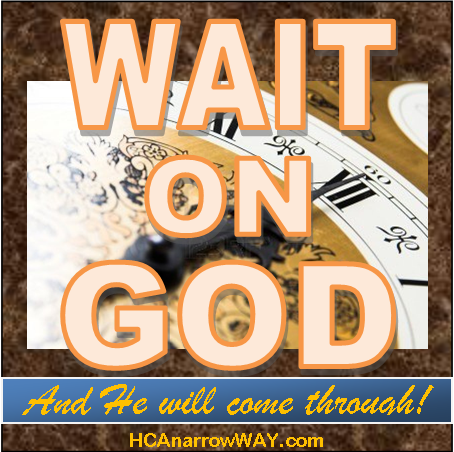 Wait on the Lord and He will surely come through. It's always worth it to wait on Him.